Cook the potato in boiling water until it is soft. Drain well, place it in a bowl and mash until smooth. Add the salmon, spring onion, chopped parsley, sweet chili sauce and lemon juice, and mix to combine. Divide the mixture into equal portions. Shape each portion into round patties with wet hands. 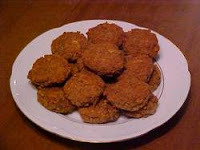 Coat the patties lightly with flour, then dip each one into the beaten egg and coat with the breadcrumbs. Cover with plastic wrap and refrigerate for one hour. Heat about 1/2 inch oil in frying pan to moderately hot. Add 4 patties to the pan, cook for 4 minutes each side, or until golden brown. Drain the patties on paper towels and keep them warm while you are cooking the remaining patties.